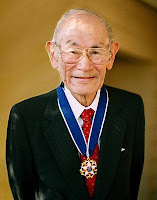 ... 2011 (today), Californians will mark the 1st annual Fred Korematsu Day of Civil Liberties and the Constitution. Korematsu was born in Oakland on this day in 1919. Though an American citizen, he, like hundreds of thousands of other persons of Japanese heritage, was interned by the United States during World War II. As we've posted, his conviction for refusal of U.S. orders was sustained by the U.S. Supreme Court in 1944. It was set aside by write of coram nobis in 1984, and 4 years later Korematsu received the Presidential Medal of Freedom (left). (photo credit) The day in honor of Korematsu, who died in 2005, was established last fall following unanimous votes in both house of California's legislature. A correction - Mr. Korematsu was awarded the Medal of Freedom, not the Medal of Honor as stated in the IntLawGrrls post. It is listed correctly in the source material and it is the medal of freedom in the image accompanying the IntLawGrrls post. Change made in text, Caitlyn. Thanks!